Spring means bluebonnets are popping up across Texas, but that also means insects are back. Tent caterpillars are so abundant in East Texas that some residents have been left in the dark. Sam Houston Electric Cooperative said the colorful caterpillars have been hatching by the millions and covering homes, trees and electrical equipment. 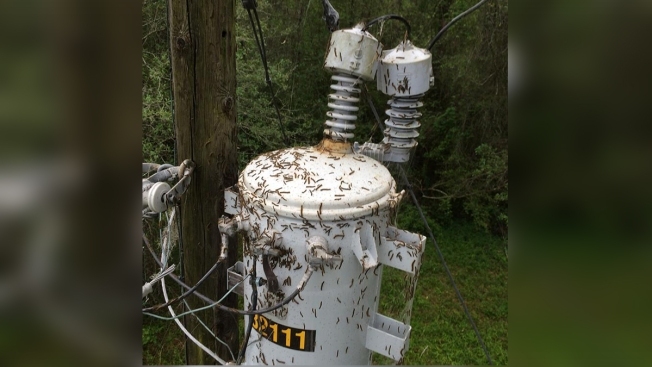 Line technicians report the caterpillars can engulf transformers, resulting in blown fuses. "The caterpillars can completely cover a piece of electrical equipment," said Sam Houston Electric Cooperative line technician Virgil Cain. "They can actually disrupt the insulating ability of the equipment and cause a power outage." The caterpillars not only swarm equipment they also feed on leaves, particularly of oak trees. According to Texas A&M AgriLife, they can defoliate a tree causing permanent damage. The damage could cause trees to fall on power lines causing power outages. Eventually the caterpillars will emerge from cocoons as brown and yellowish moths with a one inch wingspan. They no longer feed on vegetation but they do lay eggs and the life cycle starts all over again.